It is Red because it is hypervascular. It is Raised because there is four times as much collagen in a wound. It is Rigid because the collagen is disorganized and does not allow for pliability. Hypertropic scars are metabolically active for approximately eighteen months. After that time the scar is mature. This type of scarring is more pronounced in African Americans, Native Americans, Asians, and Hispanics as they are secondary to increased pigmentation. Keloids, unlike hypertropic scars come in 2 forms: raised or bulbous. Bulbous is a ball shaped growth and is commonly formed at the ear. Its appearance is the result of gravitational pull that cause the scar tissues to form away from the ear. Raised keloids are usually about 2-4mm raised above skin level but can spread over a wider surface area. Below picture shows hypertropic scars on a child who suffers from a scalding incident. 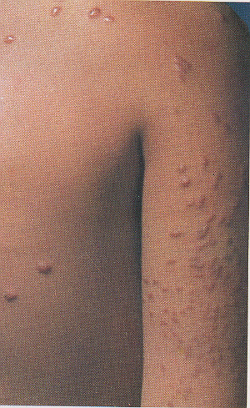 Hypertropic scars usually appear ‘plump’. 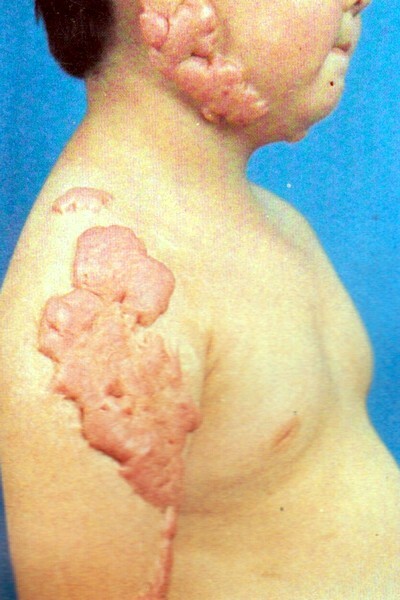 Scars and keloids do not usually cause medical problems. One exception is cesarean (c-section) scars. Some women experience spotting after their menstrual flow has finished due to their cesarean scars. Other people experience chronic pain that is associated with a scar. Even if a scar or keloid is not causing a medical problem, they are unsightly and unappealing from an aesthetic point of view, and often creates mental discomfort. It is therefore important that at the first sign of a scar formation, treatment must be instituted to prevent it from growing. A small scar the size of 0.5cm can grow and ‘spread’ to over 900% of its original size. We also advise that the patient not seek traumatic treatments like surgery or injections without an effective post surgery treatment plan. Recurrence level is very high, often leading to ‘hyperplaxia’, a condition of acute keloid formation. (See pictures below: a single patch of keloid has deteriorated to a severe formation of collagen matrix). It is a regret that scars, being such a common occurrence in everyone’s experience that little attention is paid to them unless a large area of the skin is involved or a cosmetic or functional problem results from the location of the scar. Scars are regarded as products of the natural repair of injured tissue. The healing of the wound begins with the body’s outpouring of blood and serum into the defect, the formation of fibrin from fibrinogen, and the migration of fibroblasts and blood vessels into this matrix. New collagen is laid down by the fibroblasts, and a new epidermal surface forms from the migration of epidermal cells across the wound gap. Keloids and hypertrophic scars result from an abnormal growth of collagen tissue in a scar. An impaired weave of collagen matrix may still form at the point of invasion. Multiple injection points often cause the worse form of reformation. Forced flattening with steroids, freezing, bruising will only complicate the process of repair. Steroid injections, for example, have already caused the wounding of the skin and the consequence is for scar tissues to develop over the wound. Our remodelling treatments, however, will accelerate the process, hence, the regrowth is visible within a shorter period. Once the steroids wear off, the keloid will start to reform. Our treatments accelerate the process of removing the steroids within the keloids. In this process, the treatment can mitigate the regrowth but not completely eradicate the reformation. Under the influence of steroids, the keloid is very susceptible to the food substances consumed, eg, garlic, seafood, etc. Because of the high Blood content with the keloid mass, they can easily respond to these food substances by becoming red (temporary). Please note that steroid injections and cryotherapy are invasive methods of treatment which suppresses and force the dissipation of the scar tissues. This traumatize the skin to a great extent and is not a natural treatment for the skin but is the manipulation of chemicals to bring about a mechanical change. It is recommended that keloids which have been treated with steroids or other invasive treatments should delay our treatment until the steroids wear off. Old TCM practitioners used the example of a tree burl to illustrate the nature of keloids. Examine the similarity of this tree with wound ‘scars’ with the picture above. These burls are caused by any number of natural factors that include: knot location, genetic components or naturally occurring damage to the bark. The mechanism of keloids and burls are almost similar in that removal by physical excision will stimulate the formation of more growths. A cut through a burl reveals tight bunches of small knots or eyes. Similarly, a cut through a keloid will reveal a dense built up of fibrous dense tissues arrange tightly around each other. Some species of trees like Walnut and Redwood are prone to forming burls. 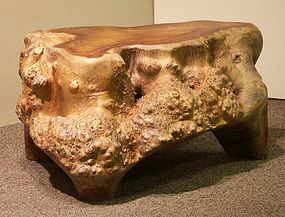 Burls are prized for their unique appearance in furniture manufacture. Keloids formed at mid-chest can be the most daunting of keloids to treat. On the left is a normal chest muscle structure. There is a ‘bridge’ of muscular tissues across the 2 chest muscles. 95% of chest keloids are formed at this precise location. This location is where the muscles are already raised and easily developed through physical activities. Keloids at this location grow at an accelerated rate and will take the longest amount of time to flatten. Moreover, it will not flatten to normal skin level as the tissues at this location is already raised to begin with. Non-invasive treatment is necessary to prevent an exponential growth of scar tissues at this location. If we subscribe to the Western theory of keloid formation, ie. tension, chest keloid best illustrates the mechanics of this theory. Tension prevented the collagen matrix from forming into an organized mass in the process of wound healing. The delay resulted in the scar tissues being formed in disarray. Physical exercises will accelerate its growth and reach. Common area for keloid formations is at the chest, earlobes and jawlines. Scars at the knees and elbows are often hypertropic scars. The Hei Ba Gao, Ba Hen Ling (Silicon gel + snake oil) and the Ba Hen Ling (Keloid salve) can be used in combination for optimal result. The Hei Ba Gao is the most effective softening and flattening agent in comparison. An immature scar, if put on intermittent stretch, remains immature and many may become exaggerated. A preferred scar is one that has matured rapidly without contracture, thickening and without forming more collagen than is necessary for its strength. How, then, do we accelerate scar maturity in a controlled manner? Two critical factors have been isolated as major factors in wound healing modulation, namely ‘hydration’ and ‘processes of repair’. 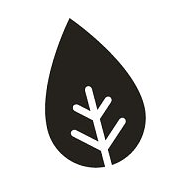 Hydration has been shown to be the principal mode of action of silicone gel, but more importantly, it was found that silicone was not essential to the process, – hydration alone significantly inhibits fibroplast proliferation (which results in less scar tissue formation). Hydration is believed to reduce water vapour loss and restore homeostasis to the scar. Hirudoid leech cream and the the silicon gel sheet has also been effective in this function. Users are advised that treatment for mature keloids can take up to 18 months. It is important to initiate treatment as an untreated keloid has the potential to grow and spread, causing more inconvenience. Physical exercises (which stimulate the surrounding tissues of the keloid) and an incorrect diet will also cause temporary ‘puffiness’ to the keloid. In Chinese medicine, diet plays an important part in keloid formation. The keloid is filled with capillaries and the type of food consumed is quickly reflected on the keloid, triggering sensations of itch, pain and inflammation. Individual sensitivity to certain foods can be translated as temporary swelling, itch and pain. As a general rule, avoid seafood, beef, mutton, alcohol and chillies during treatment. Fruits and vegetables to avoid include: garlic, grapes, durians, pineapples, cranberries and pumpkins. These foods can stimulate the keloid and accelerate collagen activity, causing aggravated itch and pain. Therefore, collagen supplements should be avoided too. Keloid prone persons are seriously advised against inflicting wounds to the skin and to reduce inflammatory acne as these can often give rise to keloids. With effective treatment, a keloid can remain small and even unnoticeable, elastic and less irritable. Seek treatment early. Early treatment can make a difference as to the time and expense needed to treat a larger keloid. …….. Added on May 17, 2011……………….